※ DX-113 is not produced currently; it is not sold any longer. AX-S1 is a sensor device, which plays the role of eyes and ears of robots. Distance of an object, Brightness of surroundings, heat, and sound detection functions are included; additionally, IR remote control receptor and sound-making functions are included. 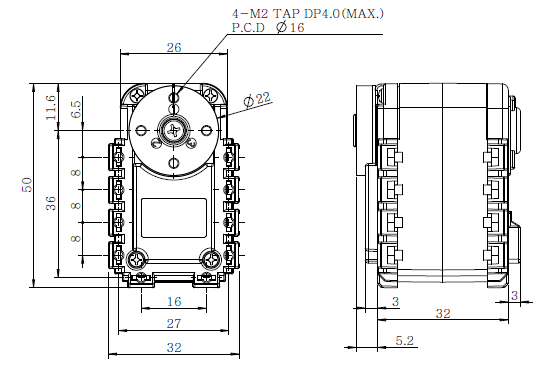 The configuration and the communication type of AX-S1 are equal to AX-12+'s, but it is not operated by servo motor.. The communication method and the hardware composition related to the communication of AX-S1 are the same as Dynamixel AX series. Please refer to Dynamixel Communcation on the communication method and the packet composition. 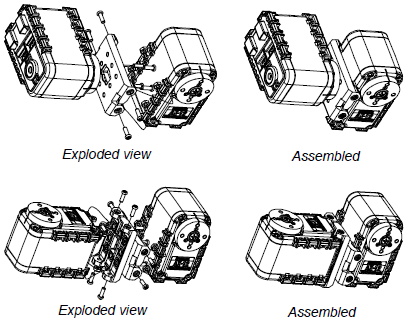 Please refer to Communication Hardware Composition of AX-Series on the communication hardware. Feedback : Infra-red Sensor, Internal Mic, Temperature, Input Voltage, IR Remocon Tx/Rx Data, etc. Control Table consists of data regarding the current status and operation, which exists inside of Dynamixel. The user can control Dynamixel by changing data of Control Table via Instruction Packet. Data in RAM area is reset to the initial value whenever the power is turned on while data in EEPROM area is kept once the value is set even if the power is turned off. It represents the location of data. To read from or write data to Control Table, the user should assign the correct address in the Instruction Packet. Dynamixel has two kinds of data: Read-only data, which is mainly used for sensing, and Read-and-Write data, which is used for driving. In case of data in the EEPROM Area, the initial values on the right side of the below Control Table are the factory default settings. In case of data in the RAM Area, the initial values on the right side of the above Control Tables are the ones when the power is turned on. In the Control table, some data share the same name, but they are attached with (L) or (H) at the end of each name to distinguish the address. This data requires 16bit, but it is divided into 8bit each for the addresses (low) and (high). These two addresses should be written with one Instruction Packet at the same time. It represents the Model Number. It represents the firmware version. It is a unique number to identify Dynamixel. The range from 0 to 252 (0xFC) can be used, and, especially, 254(0xFE) is used as the Broadcast ID. If the Broadcast ID is used to transmit Instruction Packet, we can command to all Dynamixels. Please be careful not to duplicate the ID of connected Dynamixel. It represents the communication speed. 0 to 254 (0xFE) can be used for it. It is the delay time per data value that takes from the transmission of Instruction Packet until the return of Status Packet. 0 to 254 (0xFE) can be used, and the delay time per data value is 2 usec. That is to say, if the data value is 10, 20 usec is delayed. The initial value is 250 (0xFA) (i.e., 0.5 msec). It decides how to return Status Packet. There are three ways like the below table. The reference value is set in the estimated place where an object exists on the direction of the sensor in the IR sensor value of Dynamixel Sensor Module. If the sensor value is greater than the reference value, the bit which belongs to the sensor of IR Obstacle Detected (Address 0x20) is set to '1' because the object is located within a certain distance; if the sensor value is less than the reference value, the bit is set to '0' since the object is not located within a certain distance. IR Obstacle Detect Compare Value is assigned to two places: ROM(Address 0x14) and RAM(Address 0x34), and when the power is turned on, the value of EEPROM is copied to RAM. The reference value is set in the estimated place where a light is turned on in the light-brightness sensor of Dynamixel Sensor Module. If the sensor value is grater than the reference value, the bit which belongs to Light Detected is set to '1' because the light is brighter than a certain brightness; if the sensor value is less than the reference value, the bit is set to '0' since the light is not brighter than a certain brightness. Light Detect Compare Value is assigned to two places: ROM(Address 0x15) and RAM(Address 0x35), and when the power is turned on, the value of EEPROM is copied to RAM. It is the IR sensor value of Dynamixel Sensor Module for distance measurement. If the infrared rays are emitted from the IR-emitting part of AX-S1, the emitted infrared rays are reflected after hitting walls or objects. The amount of the reflected rays is measured by the IR-receiving part of AX-S1, and the higher value is acquired, the closer walls and objects are located. The measured values have the range of 0~255; only 255 may be appeared if any object or wall is located within a certain distance. Since it is an IR-mesurement type, reflection ratio may vary depending on the color and the surface texture of walls and objects; the measured value can be different from the expected value. 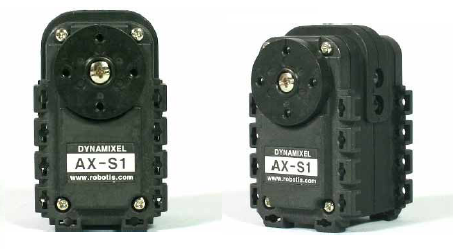 It is the light detection sensor value of Dynamixel Sensor Module. The concept of this sensor is similar to IR sensor value's, but it is measured without turning on the IR-emitting part; it can measure only infrared rays from a light. For that reason, the light brightness sensor value can be measured from the light which emits a lot of infrared rays such as lightbulb, and also lights from a lighter or candles can be measurede. The measured value has the range of 0~255. If IR Distance Sensor value of AX-S1 is greater than the reference value, a certain bit of object detection value is set to '1', judging an object is detected. Please refer to the table below on the bits each sensor represents. If light brightness sensor value of AX-S1 is greater than the reference value, a certain bit of light detected value is set to '1', judging a light is detected. The level of the sound which is coming into the mic of AX-S1 is measured and converted into numerical value. 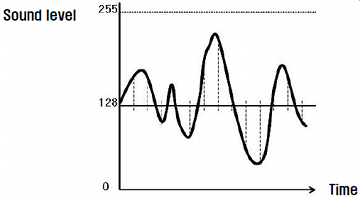 Because the sound level is fulctuated up and down as below, if there is no sound, the numerical value of 127~128 (0x7F~0x80) is got, and it gets closer to 0 or 255 (0xFF) as the sound gets louder. The sound level is entered about 3800 times per second. The loudest sound level is saved separately among the sound levels of AX-S1. That is, if current sound level is louder than the saved maximum sound level, the current sound is copied as maximum sound level. Therefore, the sound level lower than 128 is actually ignored, and it is assumed that the loudest sound level at the moment is accumulated and saved. See the following picutre for better understanding. Be careful if the maximum sound leve becomes 255 (0xFF) while being accumulated, the maximum sound level remains 255 because it cannot exceed 255. Therefore, '0' must be written on the maximum sound level part to measure the maximum sound level. AX-S1 has a function to count 1 time if a certain level of sound is made. For instance, it is possible to count the number of claps. However, to prevent 1 clap from being counted as multiple claps, once claps are counted one time, the claps are not counted for 80msec. After the last count, the counted value is saved as sound detected count in 800msec. To recognize the time when the sound detected count is increased, count the number internally, and then save the value in the sound detected count in 800msec while initializing the internal count as '0.' See the following picture for better understanding. AX-S1 has a function to save the time of the moment whenever sound detected count is done. The function is provided to detect the direction of sounds, and at least 2 units of AX-S1 are necessary. The function is based on the difference of sound-incoming time to each of AX-S1 Mics using the speed of sound (The speed of sound is about 343m/sec ot 20 degrees of Celsius). Sound detected time is counted internally (Repeating the count of 0~65535), and the currently counted value is saved when sound detected count is increased. Thus, after initializing sound detected time simultaneously to '0' using Broadcasting command by separating 2 units of AX-S1 properly from each other, if sounds are made, the time difference between the two AX-S1s occurs pursuant to the directions of sounds. If the sound source is in the front, the sound is detected almost at the same time, but if the sound source is not in the front, the time difference occurs pursuant to the apart distance of AX-S1. The direction of sound sources can be roughly estimated using the principle above. See the following picture for better understanding. A buzzer is installed in AX-S1, and simple beep sounds can be made. 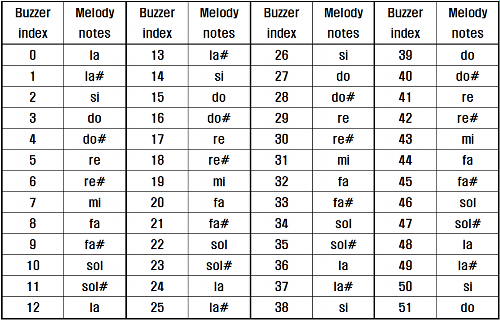 Total 52 musical notes can be made in Buzzer Notes, and various notes can be made because there are whole tones and halftones in each octave. The values of Buzzer Notes are assigned as the table below. There are 2 special buzzer ringing time functions for AX-S1. Firstly, the buzzer can be ringing without stopping. If 254 is entered in buzzer ringing time, and the number of desired musical notes is entered, the buzzer rings without stopping. To stop the ringing, '0' is entered in buzzer ringing time. IR remote controller communication is possible among other AX-S1s since IR remote controller sensor is installed on the front of AX-S1. The data can be transmitted by 2 byte unit. IR remocon data can be transmitted to any direction since IR-emitting parts are installed in 3 directions: front/left/right, but the IR remocon data can be received only in limited angle because IR remocon sensor is installed only on the front. The remocon data to be transmitted through the IR-emitting part is written. The remocon data is transmitted as soon as the value of 2 bytes is written. IR Obstacle Detect Compare Value of Address 0x14 is saved in RAM area of Control Table. Currently, it is not possible to detect normally in short distance(e.g. within 5cm distance, the maximum value is always acquired) since, in case of IR Sensor of AX-S1, infrared rays are emitted strongly to detect in long distance. Therefore, AX-S1 supports low-sensitive mode for acurate detection in short distance; if '0' is entered in IR Obstacle Detect Compare Value, it is converted to low-sensitive mode. In low-sensitive mode, the long distance sensor performance is not satisfactory, but accurate and sensitive detection is possible in short distance because it is not saturated to the maximum value. Light Detect Compare Value of Address 0x15 is saved in RAM Area of Control Table. 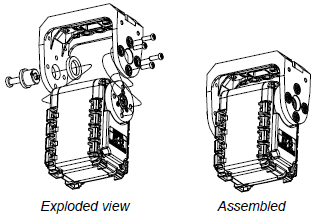 The types of AX-S1 option frames are as follows. The frame of AX-S1 is compatible with the frame of AX-12/12+. The following example shows the combination structure of option frames and horns.